Michigan fans all over the country decided to get together at their local Buffalo Wild Wings restaurant to watch the Wolverines play Kansas State in the Buffalo Wild Wings Bowl. The only problem? The restaurants weren’t featuring the game that had their own name on it. As it turned out, the sports bars had decided that they were going to make more money featuring UFC 168. "We paid for the fight, we are showing it," one tweeter reported being told when he asked them to switch to the Michigan game. 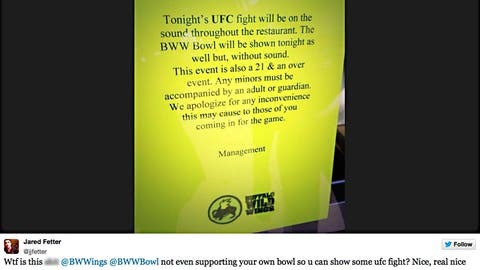 Even in the state of Michigan, BW3 customers reported that they were reduced to watching the bowl game on a couple TVs with no sound, while most of the place was devoted to Ronda Rousey facing off with Miesha Tate. According to AP’s Noah Trister, the Ann Arbor franchise had barely audible football audio with "about half" the TVs showing UFC action. "Nice. Buffalo Wild Wings promoted watching its bowl game in store all year. Yet, football fans are being turned away due to UFC tonight," read another frustrated tweet. The controversy, which spawned the unwieldy hashtag #SaveTheBWWBowlFromBWWings, came just two days after the Little Caesars Pizza Bowl got national attention for running out of pizza. A request for comment was sent to the Buffalo Wild Wings twitter account (@BWWings) but no reply was immediately received. In the end, Michigan fans didn’t miss much. Kansas State rolled over the Wolverines, 31-14.